Visualized by Rolls-Royce bespoke designer Michael Bryden, this elite collection has been created in the Rolls-Royce Bespoke design studio. It features a total of six uniquely designed luggage items, each of them created to portray the sophistication and luxury of the brand. It features two Grand Tourer valises, three long Weekender bags and one Garment Carrier, specifically designed to be accommodated in the luggage compartment of the iconic Rolls-Royce Wraith. 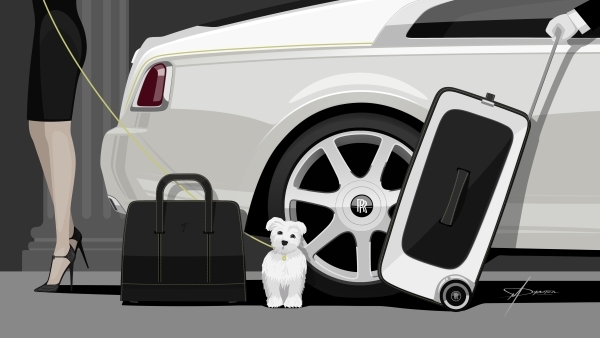 Baggage can also be custom-designed to suit each customer’s precise provisions just like every Rolls-Royce motorcar. To develop this collection the design team talked with experts who were habituated to handling personal luggage on a daily basis. Head Butlers from the world’s most luxurious hotels offered much-appreciated insight into the connection between the guests and their belongings. Luggage is so much more than a mere style statement symbol these days. It acts as a second wardrobe away from home, becoming an important part of the daily routine of entrepreneurs and important people because of their busy travelling schedules. The handles of the bag are created so as to equally distribute the weight of the bag resulting in less pressure on the holder. An invisible stitch, mirroring the stitch on the steering wheel of Wraith, has been applied to provide a subtle and smooth finish. The Spirit of Ecstasy, the flying lady figurine found on the bonnet of all Rolls-Royce cars since 1911, is exclusively embossed on the exterior of each bag. The Long Weekender make luggage effortless to carry. Finished with machine polished aluminium, this piece is designed by combining modern-day engineering with polished visual aesthetics. The Grand Tourer valise features strategically placed wheels with the Rolls-Royce double-R emblem that are specifically designed on a wide track to ensure a higher level of stability and provide an effortless transfer from ground to the luggage compartment. Carbon fibre has been used owing to its light weight and durability. Garment Carrier is the ultimate offering in this new bespoke collection and offers a convenient way to carry a gentleman’s shirt and tuxedo or a ladies gown or dress. A loop for a silk tie or scarf shows how meticulously the designers worked to enhance the convenience factor of the luggage. The Wraith collection takes luggage to a new level of sophistication and an enhanced realm of luxury. Master craftsmen wore white gloves while creating these pieces to ensure the quality of the leather remained unspoiled. The customer’s selection of a single or vibrant two toned leather finish, hand-stitched leather featuring the colour thread used in the owner’s car and a monogrammed lining that discreetly exhibits the Rolls-Royce emblem provide the final finishing touches to the elegant Wraith luggage collection. You can either buy a single piece or get the entire collection from your nearest Rolls-Royce Dealership for about Rs. 29 lakhs. Tagged LifeSpice, Luxury Travel, Sartorial Notes. Bookmark the permalink.